Facebook today announced that it has begun testing ads in the Messenger app. The test will be limited to users in Australia and Thailand and will allow businesses to place ads on the Messenger home screen below favorite users and most recent conversations. The company says that "no one will see an ad in a conversation without clicking on an ad experience on the Messenger home screen or starting a conversation with a brand." Facebook assures that ads will not "originate" in conversations. Facebook says businesses have told the company that they're excited to use the Messenger platform to connect to its billion users, driving sales and building brand awareness. Currently, Facebook runs ads on its News Feed that, when clicked, take users into Messenger conversations with brands. This has helped person-to-business messaging grow popular, with Facebook saying over a billion messages are sent a month between people and businesses. 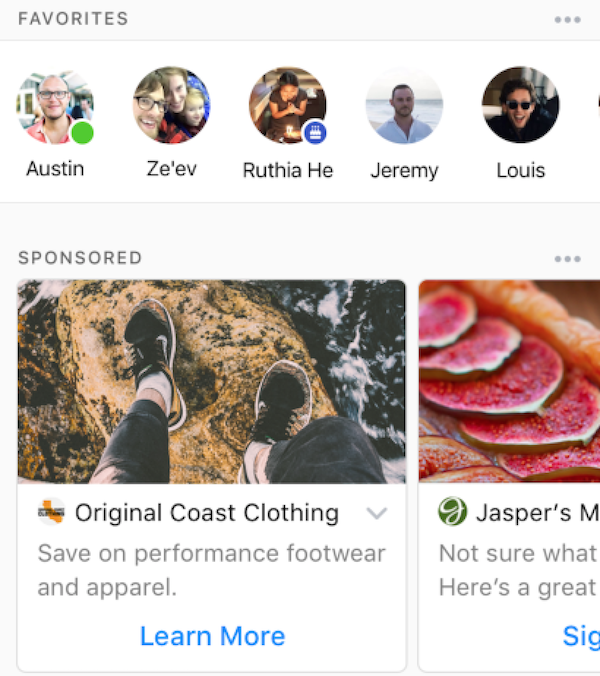 Messenger users will have "complete control" over their experience, and will be able to either hide or report specific ads using a dropdown menu, similar to how users can report ads on their News Feed. Additionally, advertisers are not allowed to directly message users unless the user initiates the conversation. The test will only work for a "very small group" of people in Australia and Thailand, and Facebook says the company will take its time before it considers further expansion. Another service that lures people into it as free then puts ads. If you use any such "service" that bills itself as free, you should know that YOU are the product. I honestly didn't think the Messenger app could be any more sickening than it already is. Leave it to FB to prove me wrong. Also, never once have I purchased anything through a FB ad; most of them seem so sleazy and sketchy. keeps resurfacing "Active Now" and "Favorites" list— especially since the latter is nowhere close to even having a sliver of accuracy in my case. This just makes me hate facebook even more. It's been a necessary evil in my life, but it keeps inching closer to deletion every year. I've hated that I've been 'forced' into messenger on my iPhone. I just know I'm going to hate the adverts even more. I guess I won't be using Messenger anymore. Come on! I'm already served enough ads in my newsfeed as it is! They don't have to put ads in every single one of their apps. Come on now! Facebook is invested with ads, advetorials, fake news and click bait articles these days. I see more of those than actual posts of "friends", most of them being filtered away without asking. It's only fitting Facebook Messenger is heading the same way I guess?